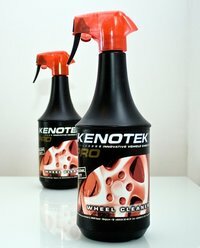 A totally safe wheel cleaner for all types of wheels - alloys, steels, wire wheels etc. Removes black brake dust deposits and road grime from all rims. Strong in effectiveness but also safe to use. Strong 1 litre bottle with efficient spray cap and safety lock, professional grade product at sensible prices.